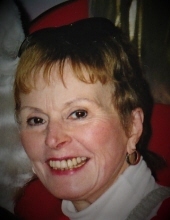 Phyllis Joan “Joann” Brennan of Southfield passed away on November 10, 2018 in Beverly Hills. She was born on February 27, 1936 in Tobacco Township, MI to the late Robert and Vivian Knapp. Loving wife of William E. Brennan, whom she married on November 21, 1959. Caring mother of Tyler Brennan, Julie (Harold) Muzzi, and Lisa Brennan. Dear grandmother of Maria Muzzi and Billy Muzzi. Beloved sister of Lee (late Pat) Knapp of Dexter, MI and Nancy (Tom) Deal of Modesto, CA. She will be dearly missed by many nieces, nephews, relatives and friends. To send flowers or a remembrance gift to the family of Phyllis Joan Brennan, please visit our Tribute Store. "Email Address" would like to share the life celebration of Phyllis Joan Brennan. Click on the "link" to go to share a favorite memory or leave a condolence message for the family.